Today I am going to show you how to disable a Ribbon Item using Group Policy, Okay, what’s the deal you might think, simply find the item within the Office GPO settings and enable it. Right,almost, it’s just that Microsoft didn’t list all possible settings within the Office ADMX/ADML file, probably because there are too many of them. But there is a setting called “Disable command bar buttons and menu items” that you can enable and specify the Ribbon Policy ID. Suppose we want to prevent users from selecting the Theme Option when creating a new e-mail because we don’t want them to send fancy e-mails with flowers in the background. 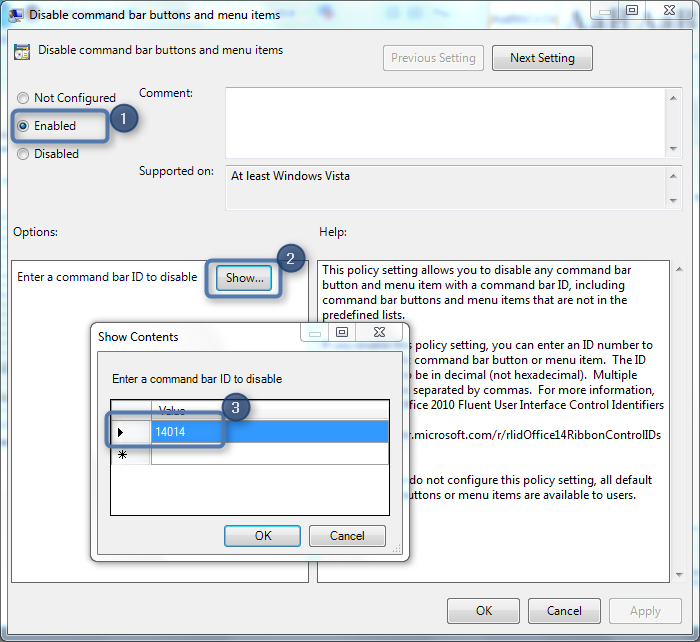 Before we can actually start enabling the “Disable command bar buttons and menu items” Group Policy Setting we need to know the Policy ID for that Ribbon item. 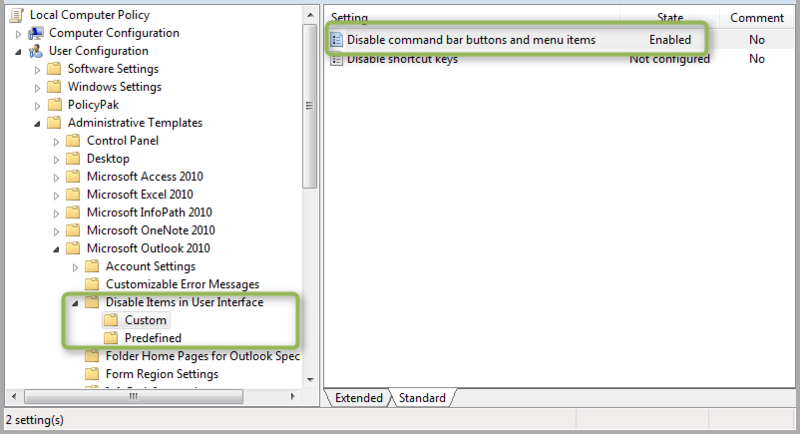 These can be found in the Office 2010 Help Files: Office Fluent User Interface Control Identifiers. Once you have the executable downloaded and extracted the content you will see a whole bunch of Excel files. Now Microsoft is going to make a scout of you, you will need to search a bit, in this case we are going to use the OutlookMailComposeItemControls file. and search for the Theme control IDs. Once you have found the corresponding ID, open the Group Policy editor and open the “Disable command bar buttons" and menu items” setting. Once you have added the ID, click OK and apply the setting. Open a command prompt and run gpupdate to get the settings applied and then open Microsoft Outlook 2010 and create a new mail. As you can see in the screenshot below, the Themes options is now disabled. Great work. I am also wondering if you have any guidance how to disable/grayout/lockdown options under file menu. What I am looking for to lockdown info under File menu. I also need to lockdown tools option that is listed on save as window. Wow thanks for this great article! Helped a lot! Really helpful article, just what I needed. I am able to disable specific menu items, but adding a ‘Group’ (eg. GroupGetExternalData	– group	(Core Tab)- 11624	) doesn’t seem to work and the group is still displayed. Just in case you’re trying to hide stuff from Office 2013, note that there are newever sources for this. Office 2013 question: How about third party tools which are added to the ribbon? How do we identify them? In our setup we have a third party application which installs a separate tab in the Word 2013 ribbon. I would like to hide this tab from some of the users. We use a standardized virtual desktop with all the software on it and then use Group Policies to control access to the various applications based an AD group memberships. This works fine for most of the stuff but I still haven’t figured out how to hide this tab in the ribbon. Grateful for any information that can point me in the right direction. The only thing i can think of is that you disable the add-in entirely. I would not know how one could reference only specific buttons of a 3rd party tool . Kaare, did you find your solution? I’m looking at the same problem as you are and wondered if you could offer any guidance. @Scott -Sorry for the late reply. For some reason I got a notification of your post yesterday. Probably too late an answer for your specific problem, but others might benefit from an answer so here goes: I ended up using GPO with item-level targeting to manipulate registry entries to accomplish the desired result. The item-level targeting ensures that only users who are members of the spesified security group are given access to the add-on. I made one entry targeted at the members of the security group that would set the DWORD value of “LoadBehaviour” for the add-in to “3” (Load) and one for none-members that would set it to “1” (Do not load). I hope this can help somenone. Hi I’ve managed to get this working for Office 2016.